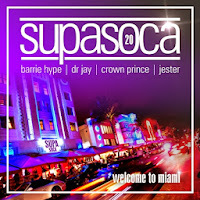 Miami Carnival is this weekend and if, like the CalgarySoca crew, you aren't going to be there the least you can do is add these mixes to your library. Pure Miami Heat! This has become the MUST HAVE remix Soca CD series of the year featuring some of the world's best known DJs. Now up to volume 20 and featuring Soca fused with EDM genres in a mix of All-Energy-Goodness. Get this one on your mp3 player now! Crowd favourite, DJ private Ryan also delivers a massive Miami warm-up mix. New releases from Barbados, Trinidad, St Lucia, Antigua ,Grenada, St Vincent and some flashbacks of Trinidad Carnival 2013 all in 45 minutes. Enjoy!